Casting Ildhane is a complex procedure as the recess that holds the the candle as well as the impression at the bottom of the base are achieved by placing hand made ceramic plugs into the sand molds, before the molds are closed and filled with molten iron. Ildhane is manufactured in Poland. 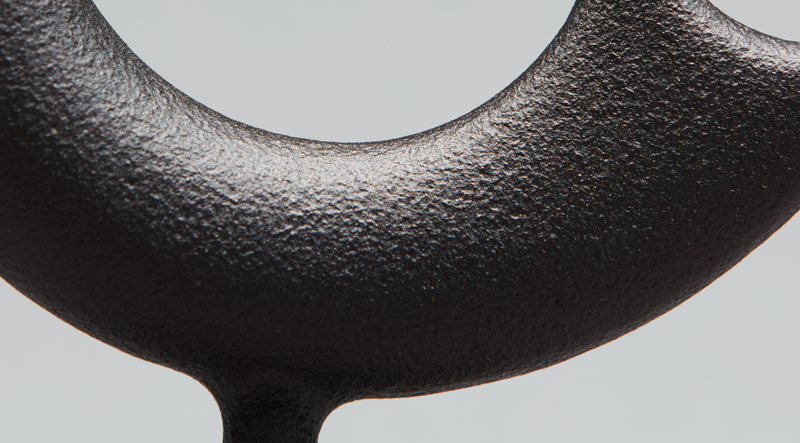 Cast iron is a group of materials where carbon in the form of graphite is added to the mix. The physical properties of these materials is closely linked to how the graphite structures itself inside the alloy. In Ductile irons the added graphite forms internal spherical structures rather than the flaky structure you would find in stiffer but more brittle grey iron. Sharp graphite flakes create stress concentration points within the metal matrix – rounded structures prevent the creation of cracks. Ildhane is made from GGG50 cast iron which is a type of ductile iron. This allows us to keep the slender stem of Ildhane. We trigger the spherical formation of the graphite by mixing magnesium into the furnace.